2018 was a year of adventure tourers. Triumph brought in the Tiger 800 and 1200, BMW brought in the F750 GS and F850 GS and more recently Suzuki introduced the V-Strom 650. 2019 is expected to be similar. Benelli has already announced the launch of the TrK 502. Here are a few things that you need to know about the bike. Benelli showcased the TrK 502 at the Auto Expo 2016. At the time, the company was scheduled to launch it in 2017, its partner DSK Group’s financial trouble forced them to hold it back. The Italian brand has now partnered with Hyderabad-based firm Mahavir Group. The TrK 502 will be the first motorcycle to be launched with their new partners. Benelli will officially launch the TrK 502 in India on 18th February 2018. The motorcycle will be launched in two variants – standard and X. While the standard variant will be road-biased, the X trim will be more off-road focused. Although in terms of design, both variants will look more or less identical – except of course the badges – there will be a lot of differences to suit their respective natures. While the X trim will come with wire-spoke alloy wheels, the standard model will come fitted with alloy wheels. Similarly, being off-road focused, the TrK 502X will come fitted with a larger 19-inch wheel up front and a 17-inch one at the back. The standard model will sit on 17-inch wheels at both ends. In terms of the powertrain, both motorcycles will be identical. The TrK 502 comes with a 499.6cc liquid-cooled parallel-twin motor that puts out 47.6bhp and 45Nm. This engine comes paired with a 6-speed transmission. Suspension duties are performed by upside down forks at the front and a monoshock setup at the back. Stopping power comes from two 320mm discs on the front wheel and a single 260mm disc at the back. 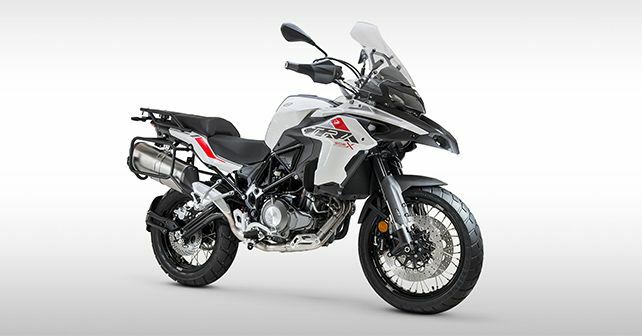 Expect the price of the Benelli TrK 502 to fall in the Rs 5 lakh to Rs 6 lakh bracket. At that price, the Benelli will undercut rivals like the Kawasaki Versys 650, SWM Superdual T as well as the Suzuki V-Strom 650XT. It must be noted here that all of these competitors make more power and torque than the Benelli TrK 502. Our Italian partners, Quattroroute got their hands on the Benelli Trk 502 last year, here's a detailed review.